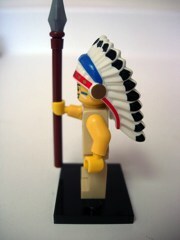 Moving along, the Tribal Chief (Indian) is the second Native American in the ongoing LEGO Minifigure line. This one has a hat that is also the hair piece, with a big feather headdress and some black hair painted on the back, plus red, gold, and blue paint adds to the look of the garment. It's nice. 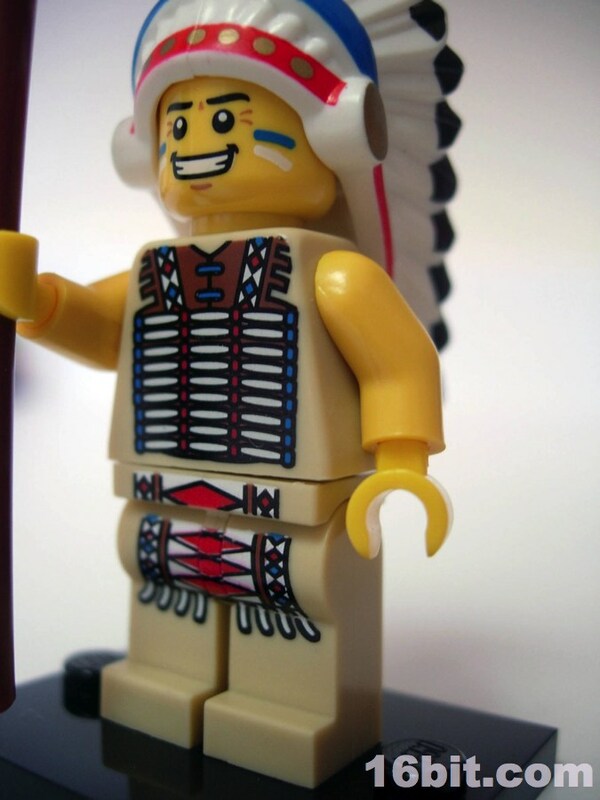 The deco meets with expectations nicely, with "bare" yellow arms and an especially intricate paint job on his chest. The face has some brown wrinkles flanked by a huge smile and blue and white facial paint, and the chest has a brown vest with red, white, and blue decoration and the omnipresent black outline. We couldn't live without it. 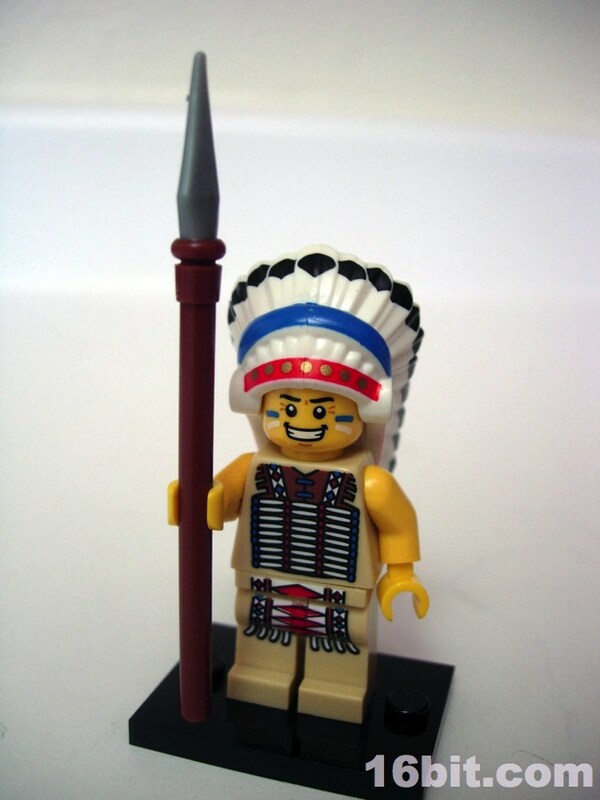 There have only been about two Native American figures in the past decade-- prior to that was a "Civil War/Western" theme with a few legendary sets like Fort Legoredo and the Rapid River Village. 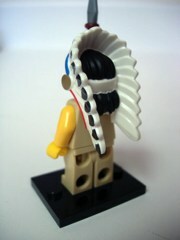 (The headdress of the Tribal Chief is identical or at least similar in sculpt to the latter set's figure.) 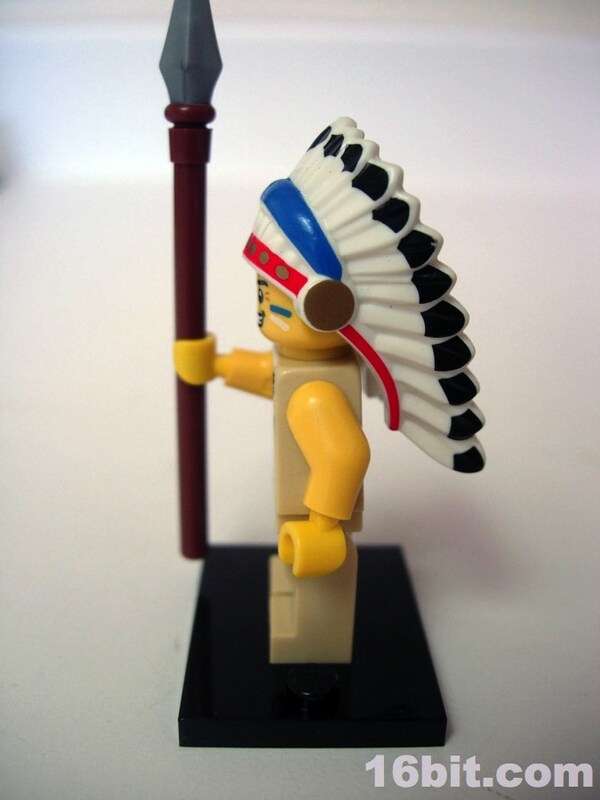 The 2011 figure takes advantage of new things like paint on the legs and much more detailed chest deco, but when you get right down to it it's only a small evolution. The new one is unquestionably better, but if you have the originals (aside from the vibrant facial expressions) either should satisfy your needs. 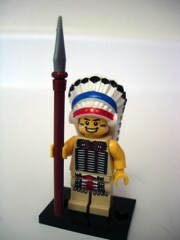 Oh, and I almost forgot the spear! 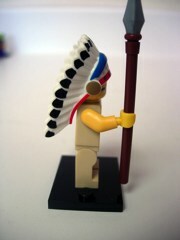 The hard brown plastic spear has a soft, somewhat flexible grey tip. It has been used with other figures, but it's a great design and one I believe you'll be happy to have in your toy stash. I like this figure a lot, but since I don't have an appropriate place to put him he's going into storage or going to be spinning a sign in front of some to-be-determined city storefront... if I get some sort of "town" thing set up some day sooner or later. 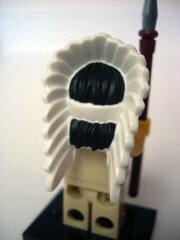 The collector in my loves it, but the toy person just doesn't know where to put it right now.